﻿﻿﻿﻿ Aren't these precious! Inspired by a rainbow version, I decided to try a striped Mardi Gras cupcake in honor of our blogiversary. These cupcakes were easy to make and turned out so cute. This is a kid friendly baking project, too. The colored batter reminded me of bright play dough once it was mixed. What child would not love to play/bake with bright colored batter? My version of these cupcakes is purple, green and gold for Mardi Gras, but any fun combination of colors would work. How about red and green for Christmas or purple and gold to support my favorite football team? Get creative! You can swirl the colors together in the batter or just layer them like shown below in the tutorial. 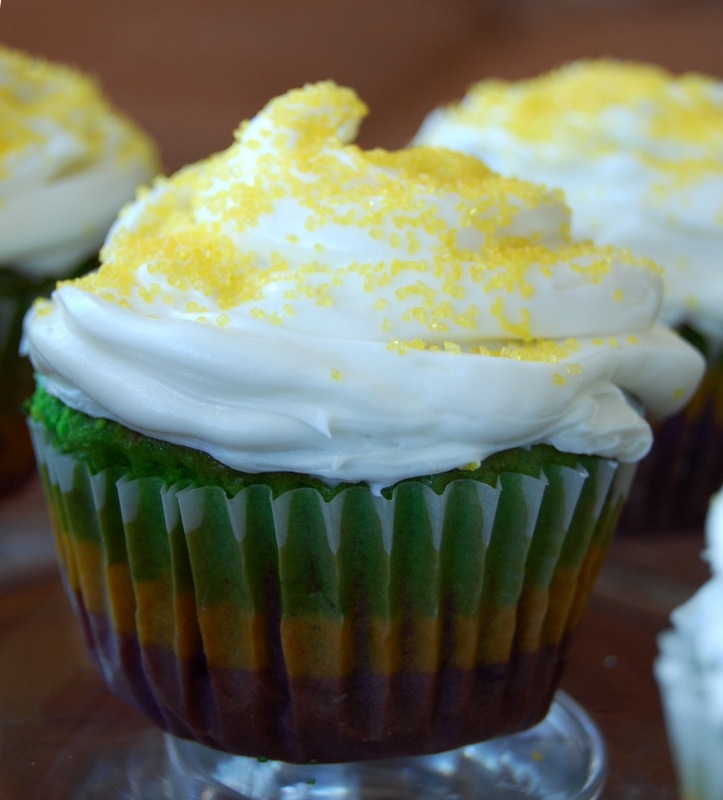 Swirling gives the baked cupcakes a tie-dye look. 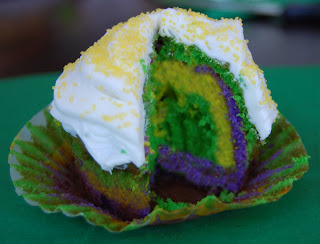 Here is the tutorial for these yummy, easy and festive Mardi Gras striped cupcakes along with a few helpful hints I learned along the way. If you make some, be sure to share your color creation with us at Ideas@mardigrasoutlet.com. Combine cake mix and ingredients needed for you mix in a large bowl (oil, eggs and water for my cake mix). Mix until combined as directed on your cake mix directions. Fold over the top edge of the plastic bags. This is to help keep the top of the bag clean when you pour in the batter. Line the bags up in a row standing up. 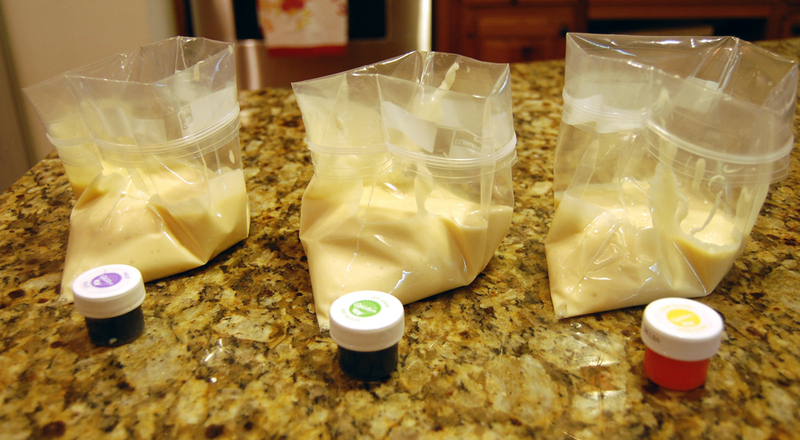 If you can not get them to stand up you can put the bag in a cup while you pour in the batter. Add equal amounts of batter to each bag. 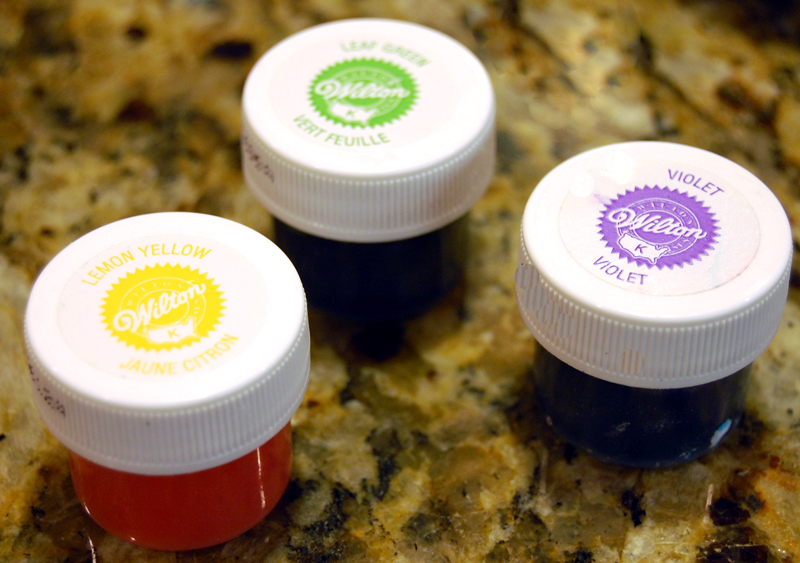 Add a small amount of gel coloring to each bag. Remember a little goes a long way. You can always add more. 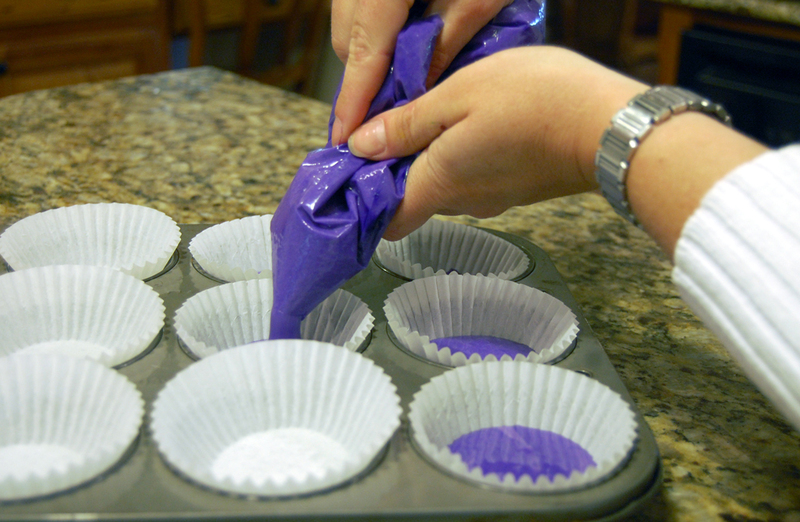 Once you add food coloring, fold the top of the bag up and close each bag, sealing out most of the air. 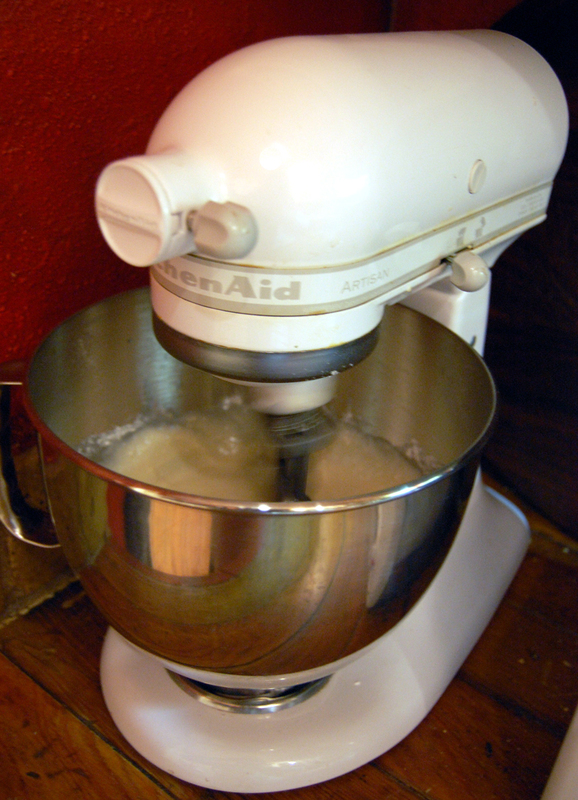 Mix the coloring into the batter by kneading the color into the batter. This is a great time for kids to help. Just make sure the bag is firmly closed. Look how festive the batter colors up! 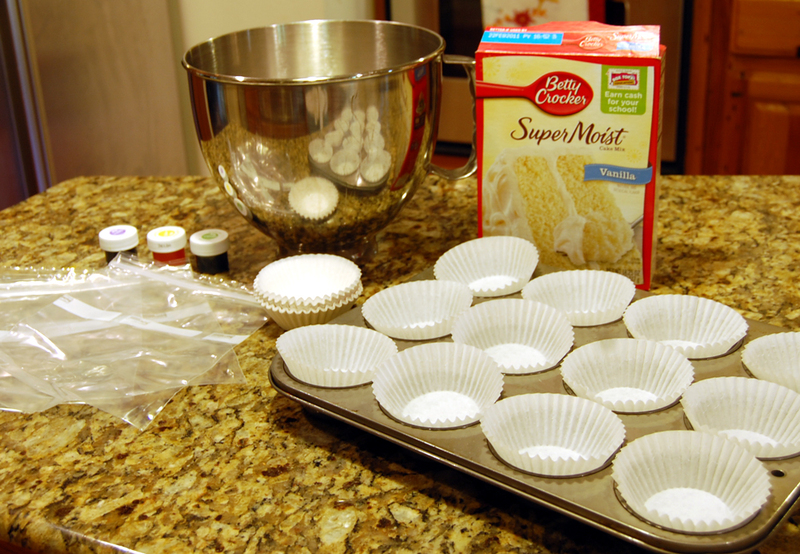 With the cupcake liners in the muffin pan, clip a small corner off your zip-top bag of batter with scissors. Use this hole to pipe batter out of each bag into a cupcake liner. An easy and mess free to add each color batter. 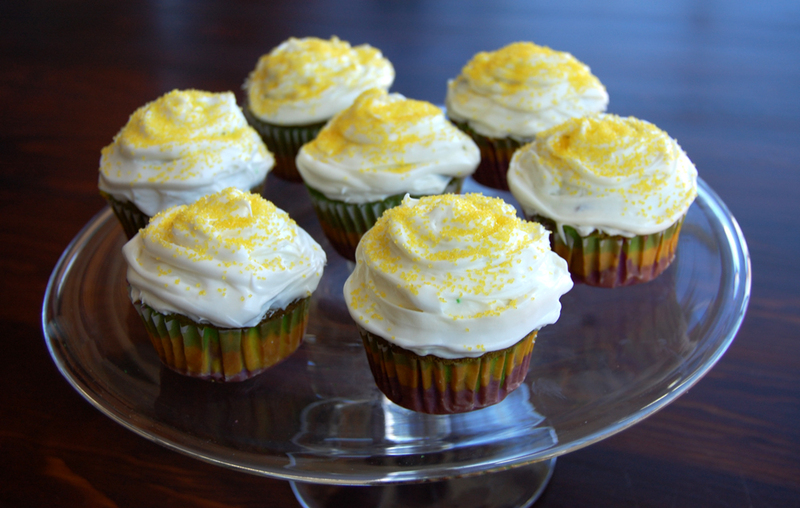 *NOTE* I put too much batter in each cupcake liner when I made these. 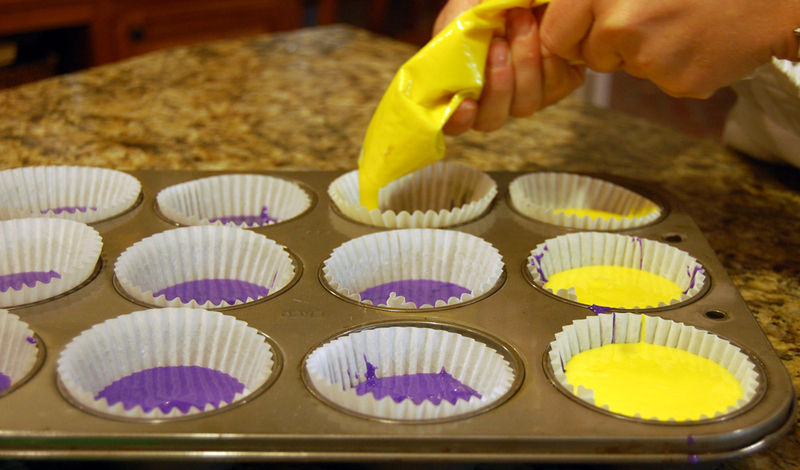 Remember, the batter will rise considerably and you have to get all three colors in. Again, less is more. Repeat with each color batter. Pipe in the batter on top of the previous color. I layered the batter in a circle when I filled them to keep the colors from mixing. When all the colored batter is poured in, bake the cupcakes in the preheated oven for the time directed on your cake mix. Be sure to use the time recommended for cupcakes (12-15 minutes for me). Let the cupcakes cool. Then ice the top and decorate. 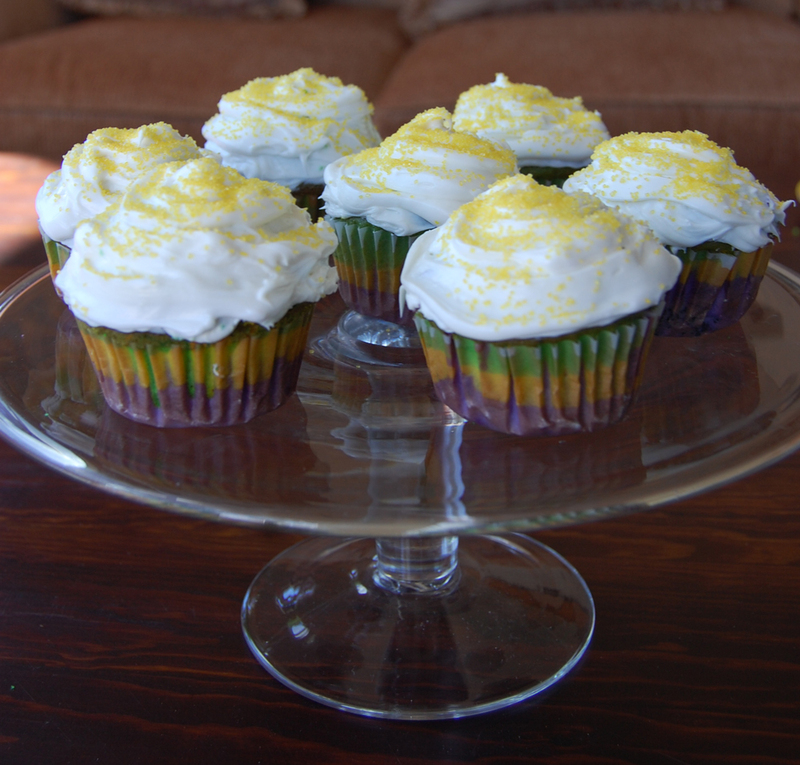 I decorated mine with bright yellow sprinkles and plain white icing to let the stripes of the cupcakes SHINE. Simply STRIPED and so CUTE! Time Flies...It's Our 1 Year Blogiversary!